Chances are, you’ve seen a glimpse of the music-maker inside your new little one, as he coos and wiggles when you sing a nursery rhyme or starts moving when you put on your favorite song. At birth, infants are already alert to musical sounds and naturally responsive to volume, movement, tempo, and melody. Toddlers are curious little people; they’re starting to explore the world and themselves and learning more about communicating with their grownups and peers. Music can help your child better understand all of these brand new experiences by giving her a valuable tool for relaxing, focusing, and expressing emotions. Here at ACMS, we’ve created a warm environment that supports your child’s natural musicality—and her overall development. And as you sing, laugh, and learn together, you’ll bond with your child and the other new parents in your class. Watch your child’s eyes light up during an Early Childhood Music class! 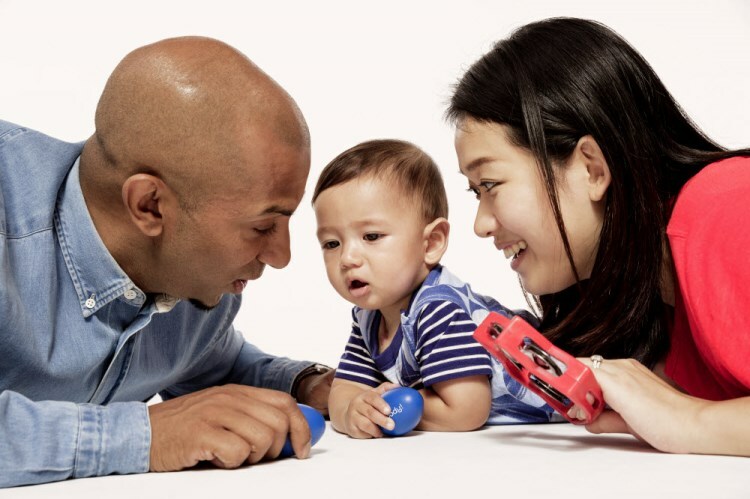 Music Together® Class length: 45 minutes Music Together is a series of mixed-age classes featuring music, playful movement activities, and instrumental jam sessions for infants, toddlers, and preschoolers. The program offers a research-based, developmentally appropriate music curriculum with emphasis on adult involvement and entire families enjoying and making music together. A parent or caregiver must accompany children to class. Class length: 45 minutes Canta y Baila Conmigo is an exciting new class where music learning goes hand in hand with Spanish immersion. You and your child will be transported as you sing, dance and play along to the irresistible sounds and rhythms of Spanish speaking countries. Suitable for children ages 6 weeks – 5 years accompanied by a caregiver.